Description: Heavy duty construction of cast iron with stainless steel trim and semi-nozzle. Note: 6254 is for ASME Section IV and is set at 15 psig only. Description: Heavy duty construction of cast steel with stainless steel trim and full nozzle. Model 300 have a 300# ANSI inlet flange and a 150# ANSI flange outlet. Model 600 have a 600# ANSI inlet flange and a 150# ANSI flange outlet. Description: Bronze body with various options including brass or stainless steel trim, top outlet, over-sized outlet, o-rings seats, and Teflon inserts. Description: Bronze/Brass construction available as a side outlet model. Optional plating as shown. Description: Available with a carbon steel or stainless steel housing and only available with stainless steel trim. Packed lever not shown. High-Temp Springs available for temperature requirements that exceed those listed below. Description: Cast steel or stainless steel body and bonnet with stainless steel internals. Available with soft seat o-rings and with a plain lever or packed test lever and ANSI flanges. Description: Bronze body, brass bonnet. 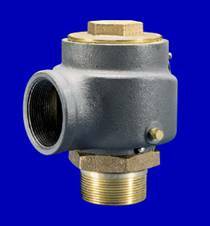 Available with brass or stainless steel nozzle. Options include open lever, packed lever, soft seat o-rings. Description: Cast iron body with bronze/brass trim for ASME Section IV low pressure steam boilers. Description: Bronze body with pull ring. Ball material is Torlon. Description: Bronze body with pull ring. Available in stainless steel trim. Description: Cast iron body, bronze/brass trim with pull ring. A high capacity valve safety valve. For temperature requirements that exceed those listed below. 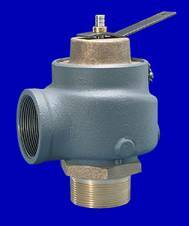 Description: All stainless steel valve to be used as a sentinel valve. Available with or without a test lever. Description: The model 20 is shown with a plain cap. The model 19 has a had wheel for adjustability. Available with stainless steel trim. Description: Available with a cast iron, cast steel or stainless steel body. All trim is stainless steel. Optional packed lever is available. 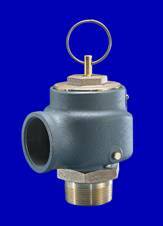 Description: The model 140 is an all stainless steel relief valve with a low GPM capacity. Description: Both the 218 and the 228 have been approved by UL and FM for fire pump installations. The 218 has a hand wheel for adjustability. Available as threaded, flanged 125# or flanged 250# inlets. Description: Cast iron body and bonnet, available with brass or stainless steel trim. Available as threaded, flanged 125# or flanged 250# inlets. Description: Cast iron body, bronze/brass for high capacity relief.